Hello, all !!! First of all, I'd like to wish all of my readers a very happy, healthy, and prosperous new year! I hope you enjoyed the holidays and that Santa was good to you! LOL! Now, on to my first project of 2012! This week's bonus challenge over at Friendship's Garden Challenge Blog is an ATC with a vintage children's theme. I haven't made an ATC in a while. An ATC is an artist trading card which usually measures 2 1/2 x 3 1/2 inches. The base is often just quality cardstock, but I like to use chipboard for mine so that the ATC is a lot sturdier. I get my ATC chipboard from Etsy. You will notice that I didn't use any images of children on my ATC. I did want to, but I just couldn't fit any into my design. Also, the challenge did not REQUIRE that I use an image of children. For me, when I think of "vintage children" as a theme, I often think of children at school. I pictured a little red school house. So, I took some red and brown cardstock and embossed them to give them a woodgrain texture. I then did a simple paper piecing to create the school house for my ATC. The background paper is actually some digital paper that I scaled down and printed. If you are interested in the kit, I can look it up for you. Just leave a comment here with your email address. It's hard to tell in the picture, but I used TH Distress Ink in Walnut Stain on the edges of the ATC and TH Distress Ink in Vintage Photo on the face of the background paper. The blue tag base is a really thick chipboard tag that I had in my stash. 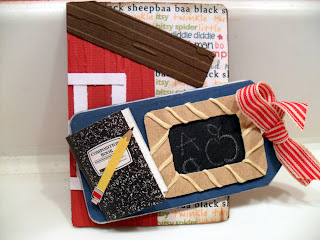 The composition book, pencil, ribbon, and little blackboard were all stickers that I found in my supplies. Gotta love it when I can put something together without having to buy anything new! If you're wondering what someone might do with a finished ATC -- well, they are meant to be traded. However, I normally just use mine on cards or tags. Finally, I'd like to make a few announcements. 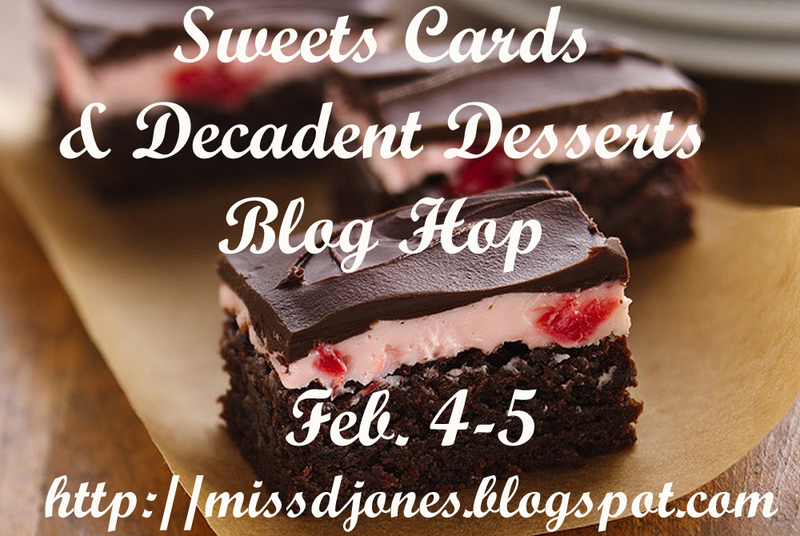 Last, please keep an eye out for some upcoming blog hops I am hosting in February and March. 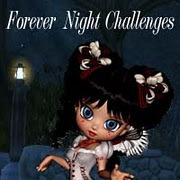 I will be posting the blog hop buttons in my sidebar. This blog hop is SPONSORED BY Kenny K. Downloads! The participants in this hop will all be using some of the sexier images from Kenny K. Downloads for their projects. One lucky commenter will win FIVE Kenny K. digi's of their choice! Well, I know that was a lot to process. Thanks for sticking with me through this long post. Have a great Wednesday! ALOHA! happy birthday! the 40's are awesome!! congrats on the design team job!! how fun!! Congrats on the design team! It sounds fun! Happy Birthday and Congrats on the Design Team!